South Tyneside Council is starting the hunt for a development partner on a new £200m riverside quarter in Holborn, South Shields. The council will shortly launch a procurement process for a housing contractor to deliver over 400 homes on the site. The plan will transform disused docks and surrounding brownfield land into a mixed use development with office accommodation, residential and a cultural offer. Councillor Iain Malcolm, Leader of South Tyneside Council, said: “We’re going to the market for a a housing partner and swiftly after, a remediation contractor, to maximise the potential of this unique site and deliver a striking, high quality offer. “Together, they will help inform the remediation works and refine the final designs for the site. 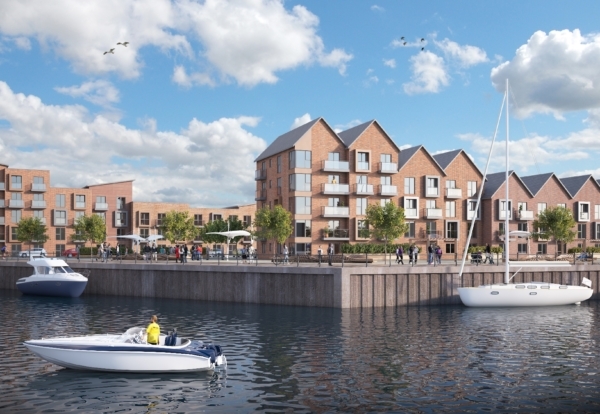 “It will build on the significant investment that has gone into the wider riverside area as well as further strengthening the river to coast corridor, with the town centre at its heart. A 4.6 hectare area of the 10.5 hectare site has Enterprise Zone status. The current proposals provide for 200,000 sq ft of Grade A office space within the Enterprise Zone plus 50,000 sq ft at Harton Quays. A comprehensive remediation strategy is in development to de-risk the site given its long industrial heritage. Martin Swales, Chief Executive of South Tyneside Council, said: “South Tyneside has a proven track record in delivering town centre and coastal regeneration.